The department was established in the year of 2008. The main objective is to impart in extent knowledge and training in the field of Mechanical Engineering covering Energy, Thermal, Design, Manufacturing, Industrial Management, Environment and to expose the latest techniques so as to cater to the growing needs of the Industries and to mould the students as EXCELLENT PERSON of our Country. Towards fulfilling the objective over the years, the department has created excellent infrastructure, laboratories, and workshops, with dedicated team of faculty. We Providing high quality Engineering Education and Technical knowledge to the students of rural community so that they could posses high caliber technocratic skills with global recognition. Shaping Machineand other standard equipments. Two Stage air compressors Test Rig and other standard equipments. Pelton and various types of pumps. Bernoulli & Flow Metersand other standard equipments. Stefan Boltzman Apparatus and other standard equipments. Compression Testing Machine and other standard equipments. The CAD/CAM center has been created exclusively to cater training of all students in the latest CAD and CAM Softwares. The software available includes AUTOCAD, PRO-E, MECHANICAL DESKTOP, ANSYS and CNC TUTOR. The offline simulation software certification courses are being run for students in PRO-E package by the in-house faculty. Our College has the state-of-art Mechatronics laboratory. This laboratory comprises Design of circuits with logic sequence using Electro pneumatic trainer kits. Simulation of basic Hydraulic, Pneumatic and Electric circuits using software. Simulation of Circuits with multiple cylinder sequences in Electro pneumatic using PLC. Servo controller interfacing for open loop. This laboratory equips the students to practice the interdisciplinary applications of Electronics, Electrical, Mechanical and Computer Systems for the Control of Mechanical, pneumatic and hydraulic systems. The Mechanical department student association "MECHADION`Z" was convened on 8th September 2010. The event was presided by Secretary of Tagore Educational Institutions. The chief guest of the day is Dr.P.Senthilkumar, Professor & Head from K.S.R College of Engineering. The Association aims to play a pivotal role in the development of students as Engineers by providing as a out-of-curriculum activities such as National and State Level Technical Symposium, Technical Quiz, Conferences, Workshops in emerging technologies and Extra-curricular activities. A National level Technical Symposium was conducted by Our Department on every year September month. During this program, several events like paper presentation, cad modeling, H2O rocketary, LOGO illusion RC racing, ROBO war, boat racing were conducted and cash prizes awarded. The following students are participated workshops in various colleges around Tamilnadu through our Mechanical Association. The welcome address given by our final year student Mr.R.LAKSHMANAN. The principal address was given by our principal Dr.S.SENTHILKUMAR, M.Tech,Ph.d. Our management educational committee member Mr.R.PARAMASIVAM, explained the importance of discipline and co-curricular activities for the development of students skills. In his speech he pointed out the technical updating for latest trends to withstand and travel in competition world. ANDAVAR Mr.R.MUTHUSAMY, JOINT SECRETARY and KOOTROAD Mr.N.R.PALANIVEL, EDUCATIONAL COMMITTEE MEMBER felicitated the function. Mr.R.DHANARAJ introduced the office bearers of mechanical engineering Association mechardionz 2k16 for the academic year2016-17. The chief guest Mr.B.PUGALENTHI, MANAGING DIRECTOR,SRI SAI INDUSTRIES, Sir explained about the placement opportunities, skills development for job and how to become an entrepreneur, how to generate the sources for the entrepreneur development. The chief guest interacted with students and cleared their doubts regarding placement, recent trends etc. The welcome address was given by Mr.R.DHANARAJ, Head of the Department. The principal address was given by our principal Dr.S.SENTHILKUMAR, M.Tech,Ph.d. Our management Mr.K.ARUNKUMAR, SECRETARY and Mr.P.KALIANNAN, TREASURER felicitated the function. The chief guest Dr.Bansal Gnanasundram.M.E,PH.D,VICE PRINCIPAL,CSI ENGINEERING COLLEGE OOTY,CHIEF GUEST and Mr.R.ARULRAJ, ASSISTANT PROFESSOR,MAHENDRA ENGINEERING COLLEGE,TIRUCHENGODE, JURY. The chief guest Sir explained about the placement opportunities, skills development for job and how to become an entrepreneur, how to generate the sources for the entrepreneur development. The chief guest insisted the importance of technical knowledge to students. The students of 100nos. from various colleges participated in the various events. The valedictory function starts at 3.45pm. The valedictory address was given our principal Dr.S.SENTHILKUMAR, M.Tech,Ph.d. The prizes distributed to winners of above mentioned events by jury Mr.R.ARULRAJ, ASSISTANT PROFESSOR,MAHENDRA ENGINEERING COLLEGE,TIRUCHENGODE and our principal Dr.S.SENTHILKUMAR, M.Tech,Ph.d. Vote of Thanks given by S.Vijayalakshmi, Final Year Students. The function came to end by 04.30pm. The welcome address given by HOD Mr.R.DHANARAJ. The Resource persons are Mr G.Mahaanaandha ,M.E., M.Kumarasamy college of Engineering, Karur and Mr.Mahesh, B.E., Business manager, VEE engineering solutions, Erode. In Forenoon session, they explained about role of prototyping technologies in production sector, types of rapid prototyping stereo lithography, 3D printer and scanner slicing software’s. In afternoon session they demonstrated the fusion deposit modeling machine and produced a prototype model of cup for students of batch wise of 20 nos. They explained about the placement opportunities, skills development for job and how to become an entrepreneur, how to generate the sources for the entrepreneur development and interacted with students and cleared their doubts regarding placement, recent trends in rapid prototyping. The welcome address given by Mr.C.RAMESH, Association coordinator. The Resource persons are Mr.Boopathi, BE., Mr.Navaneethakrishnan B.E.,CADD CENTRE, Attur. The program starts at 10.00am, they explained about role of design software technologies in production sector, designing field. They explained about the soft ware’s like ANSYS, CATIA, PRO-E, SOLID WORKS AND SOLID EDGE and how to implement in design and analytical field with applications. Finally they interacted with students and cleared their doubts regarding placement, recent trends in CAD soft ware’s. The welcome address given by Mr.C.RAMESH, Association coordinator. The Resource persons are Vanjinathan,Venkatesh and Raja CHIEF MECHANIC’s OF 3 NOS FROM TVS, VALAPPADI. The program starts at 11.20am, they explained about basics and important parts of two wheeler. They explained about the dismantling of engine in two wheeler and explained the functions of each part in forenoon session. After lunch, they explained the assembling of engine parts and electrical circuits. They interacted with students and cleared their doubts regarding maintenance, servicing importance of two wheelers and latest technologies in two wheelers. The welcome address given by our third year student Ms. P. Jayalakshmi. The principal address was given by our principal Dr. S. Senthilkumar, M.Tech, Ph.D., Our management educational committee member Kootroad Mr. N. R. Palanivel, explained the importance of character, discipline and co-curricular activities for the development of students skills. Mr. R. Dhanaraj introduced the office bearers of mechanical engineering Association MECHARDIONZ for the academic year2017-18. The chief guest introduction given by third year student Mr. M. Santhosh. The chief guest Dr. Mohamed Abdul Hafeez, M.E., Ph.D., Sir explained about the placement opportunities and how skills development is needed for job. In his speech he pointed out the technical updating for latest trends to withstand and travel in competition world. Prize distributed for the toppers of Anna university examination held at May/June 2017. The chief guest interacted with students and cleared their doubts regarding placement, recent trends etc. Finally, The vote of thanks given by our Second year student Mr. K. Thiruppathi. Department of Mechanical Engineering organized a workshop on applications of CADD & MATLAB on 11.09.2017 at A. P. J. Abdul Kalam auditorium.The welcome address given by Mr. C. Ramesh, Association coordinator. The principal address was given by our principal Dr. S. Senthilkumar, M.Tech,Ph.D., explained the importance of character, discipline and co-curricular activities for the development of students skills. The Resource persons are Mr.BOOPATHI, B.E., Mr. NAVANEETHAKRISHNAN, B.E., CADD CENTRE, Attur. The Program starts at 10.00am, they explained about usages of CADD and MATLAB Applications in mechanical Engineering in design and production field. They are interacted with students and cleared their doubts regarding Software’s are CADD, Pro-E, ANSYS, CATIA, SOLD WORKS and MATLAB etc. Department of Mechanical Engineering organized a workshop on applications of CADD & MATLAB on 16.09.2017 at A. P. J. Abdul Kalam auditorium. The welcome address given by Mr. C. Ramesh, Association coordinator. The principal address was given by our principal Dr. S. Senthilkumar, M.Tech,Ph.D., explained the importance of design software’s for using tools in mechanical field and co-curricular activities for the development of students skills. The Resource persons are Mr.G.Mohanraj,M.E., Mr.M.Manikandan,B.E., UNITED CADD SOLUTION LTD, Salem. The Program starts at 02.00pm; they are explained about the MATLAB usages and to get the result for given design in Applications of mechanical engineering. They are explained about to the students for MATLAB working procedure. They are interacted with students and cleared their doubts regarding Software’s are MATLAB, CADD, Pro-E, ANSYS, CATIA, SOLD WORKS and etc. Department of Mechanical Engineering organized a one day workshop on recent trends in designing software on 24.02.2018 at A.P.J Abdul Kalam auditorium. The welcome address given by Mr. M. BASKAR, M.E,. The Trainers are Mr. M. Santhakumar, B.E., Mr. D. Boobhathi, B.E., CADD Trainining Centre, Attur. They explained about role of product design indesigning and production field, types of application oriented work available in current marketand other field. They explained about the placement opportunities, skills development for job and how to become a design engineer, how to generate the sources for the 3D modeling and interacted with students and cleared their doubts regarding placement. Department of Mechanical Engineering organized a workshop on overhauling of two wheeler on 17.03.18 at A.P.J Abdul Kalam auditorium. The welcome address given by Mr. C. Ramesh, Association coordinator. The Resource persons are Mr. Manivel Supervisor, Chief Mechanic from HONDA Two wheeler Service Centre, Thalaivasal. He explained about basics and important parts of two wheeler, functions of each part and the dismantling of engine in two wheeler in the first session. The second session of the workshop explained the assembling of engine parts and electrical circuits. The students interacted with him and cleared their doubts regarding maintenance, servicing importance of two wheelers and latest technologies in two wheelers. Department of Mechanical Engineering organized a 7 days Faculty Development Training Programme on ME6505 –DYNAMICS OF MACHINES approved by Anna University, Chennai from 2nd June to 9th June, 2018 at A.P.J Abdul Kalam auditorium. This FDTP aims to provide opportunities to faculty members to enrich their teaching skill in the field of Dynamics of machines. Mr. R. Dhanaraj, HOD/Mech welcomed the dignitaries and the participants. Dr.S.Senthilkumar, Principal delivered the Principal address. Management member Thiru.R.Muthusamy appreciated the efforts taken by Department of Mechanical Engineering. Mr. V. Manimaran, AP/Mech introduced the Resource person Dr.J.Selvakumar,M.E.,Ph.D., Professor/Mech, Paavai Engineering College, Namakkal. The resource persons delivered the Chief Guest Address and explained importance of FDTP. Mr. P. Prasanth, AP/MECH presented vote of thanks. We invested Rs 90 lakhs for our laboratory. Mechanical Engineering Association “Mechardionz”Inaugural Functionconducted on 18.08.2016.
we conductedSeventh National Level Technical symposium MECHNITORZ 2K16 ON 24.09.2016 to caliber the students fromvarious colleges around100nosparticipantsin different activities like Paper Presentation, Water rocketry,Connexion, Moto Rally and Short Film. we conducted ONE DAY WORKSHOP ON RAPIDPROTYPINGon 06.02.17 for Final year students, WORKSHOP ON TRENDING SOFTWARE IN MECHANICAL ENGINEERING on 20.02.17 for Second year students, WORKSHOP ON OVERHAULING OF TWO WHEELER on 25.02.17 for Third year students. Our final year student S.Rogeeth won first prize in Mr.Mechanic,S.Thamaraiselvanand M. K. Soundararaj won second prize in technical quiz held at Mahendra institute of technology,Namakkal Dt. 50 students of our department had attended paper presentation, workshops, seminars held at various colleges in our state. 20 students are undergoing industrial projects and in plant training. Our Staff member Mr.V.Manimaran achieved cent Percent Result in Engineering Graphics Subject in university exam held on Nov/ Dec 2016. Our staff members Mr.R.Dhanaraj,Mr.D.Bharathiraja, Mr.M.Baskar, Mr.V.Manimaran, Mr.N.Arunprakash, Mr.R.Chinnadurai, Mr.P.Prasanthhad attended the Faculty Development Program at KSR INSTITUTE FOR ENGINEERING AND TECHNOLOGY, Tiruchengode. Mr.P.Prasanth and Miss.C.Veerapriyahad attendedthe Faculty Development Program at CK COLLEGE OF ENGINEERING AND TECHNOLOGY, CUDDALORE. 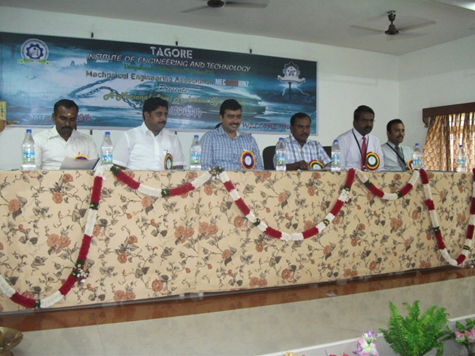 Mr.P.Prasanth had attended the National Conference at GOVERNMENT COLLEGE OF ENGINEERING, DHARMAPURI. 2014 © Tagore Institute of Engineering and Technology, Salem.